Stephane Lambiel has made quite a splash at the major figure skating championships. Three-time Swiss men’s champion, Stéphane Lambiel, only 18, has made quite a splash at the major championships. He was ninth at his first senior international competition, the 2001 European Championships, and hasn’t looked back since. 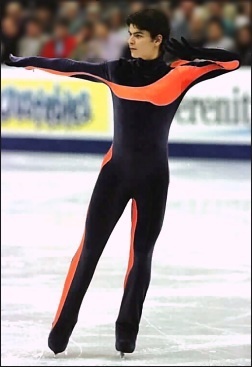 He finished fourth in 2002 and fifth in 2003, just missing the podium, but earning a chance to skate in the gala. He was 18th in his first World Championships in 2002, jumping to tenth in 2003. Lambiel also finished 15th at the 2002 Olympic Games. Lambiel started skating when he was seven in his hometown of Saxon. Since his older sister was already taking lessons, he asked his mother to let him skate too. Although she wanted him to learn hockey, Stéphane preferred the jumping involved in figure skating. By the age of nine, Lambiel was training with Peter Grutter in Geneva, a city one and a half hours by train from his home. Under Grutter’s tutelage, Lambiel progressed rapidly and within another year, he was already landing a triple toe loop, his favorite jump. After winning the Swiss junior championship in 1999, Lambiel competed in several Junior Grand Prix events, with his best finish a silver in Mexico in 2000. “Mexico was my favorite place to travel. I was impressed by the size of the city and their way of living,” he said. “I like to travel and I try to choose exotic locations for the Junior Grand Prix series when they will let me. I like to go anywhere in the United States, but especially New York.” During holidays, he frequently visits relatives in Portugal, where he likes the beaches. During the winter, Lambiel trains for about two hours a day on the ice, including a complete run-through of both his short and long programs each day. “By skating both programs every day, I feel stronger and more secure when I go to the competitions,” Lambiel stated. Grutter added that Lambiel’s determination set him apart from most other skaters he has seen. “He’s the hardest worker I have ever coached,” Grutter stated. “He even stimulates the other pupils to work harder. Part of his charm is that even when I am tired, I am stimulated by his desire.” Lambiel does very little off ice work, just some gymnastics once a week. In the summer, when there is no ice in Geneva from April to June, he does more off ice work, including physical fitness training, then spends some time training on ice at the rink in Oberstdorf, Germany. As a result, Lambiel noted that he was “very difficult when choosing music. I don’t like much of the music being used for skating. All of the most popular skaters all have the same music. War music is too loud. I want something more unusual. I like music with rhythm, Latin music or classical music.” Often coach Grutter will play music he has found at practice sessions to see whether Lambiel feels comfortable skating to particular pieces. His programs are choreographed by Salome Brunner. Last season, he skated to Laissez Moi Me Griser for the short and Chocolat for the long. Lambiel attends a school that allows him to fit his schedule around his training time. During the long train ride back and forth from practice, he does his homework and studies his lessons, especially general science, since he hopes to attend the university and become a pediatrician. Although his native tongue is French, Lambiel also speaks Portuguese and some German. “I started learning English late and am not perfect at it,” he said. Between school and skating, Lambiel has little time for other interests. “I play tennis for pleasure. Sometimes I go to watch the ballet or the circus or to the cinema. I watch comedies, musicals or action movies.” He also listens to all kinds of music. Stéphane doesn’t have any pets, but he collects ladybugs as a hobby. “I collect medals too,” he said lightheartedly.